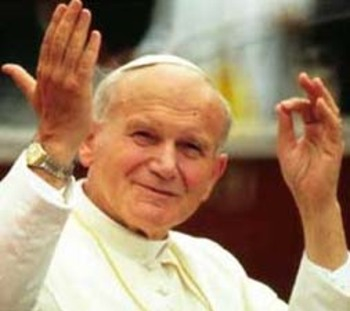 Today is the first Feast Day of St. John Paul II! I love this saint! I was a pretty jaded, cocky girl at age 28 in my RCIA class. I wasn't sure yet if I was up to joining the Catholic church. I had a lot of reservations. A big concern of mine was promising obedience to a weird "Pope Guy" in Rome. Why would some random guy in Rome know more details about following Jesus, than the rest of us good hearted people with a cross necklace and a Bible? My husband and I loved going to Independent Movies at an art movie theater outside in Rochester, New York. One night we bought tickets to see a documentary on Pope John Paul called "Witness to Hope." I came out of that movie theater shaken and sobbing. I could not believe that such a brave, holy man was head of the Roman Catholic Church. I came back to my RCIA classes with a new feeling of humility. I wasn't sure that I could promise to obey all popes in the future, but I could totally promise to follow this pope. Since my conversion, I've had the honor of loving and obeying three different popes. I praise God for this Saint because he made a major stumbling block to my conversion, obedience to the chair of St. Peter, almost effortless to overcome.